DECEMBR 30—Sprinter Karene King—who led the 100 and 200m rankings for the first time and had a consistent season despite narrowly missing the Olympic Games qualifying standard—was the BVI Athletics Association Sr. 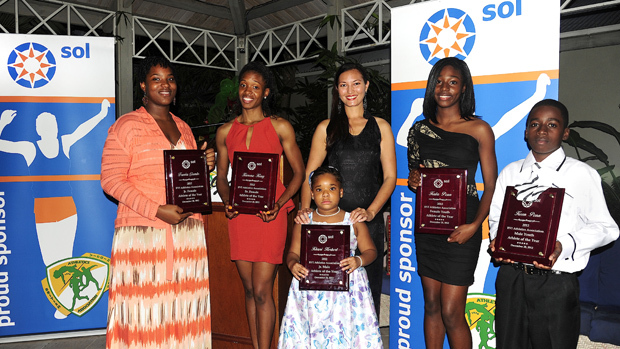 Female Athlete of the Year presented by Sol. The association’s 4th Awards Gala was held on December 28 at the Moorings Mariner Inn, at with a variety of awards were doled out including Lifetime Achievement Awards to the track and field Olympians presented by Gatorade. In the most competitive division which saw four in the running for the first time, Shot Putter Trevia Gumbs, walked away with the Sol Jr. Female Athlete of The Year award at the event that also recognized youth athletes. Competing with her twin sister and Javelin Thrower Tynelle, as well as sprinter Nelda Huggins and half miler Lakeisha “Mimi” Warner for the award that wasn’t as clear cut as in the previous three years, Trevia’s performances during the season saw her winning U17 Carifta Games Silver, Leeward Islands Jr. Championships gold and CAC Jr. Championships silver. Huggins won 100m silver in all three competitions, while Javelin Thrower Tynelle—who collected the BVI Athletics Foundation’s Most Improved Athlete award and became the territory’s first 30/30m thrower in both the Javelin and Discus Throw—bagged Carifta and Leeward Islands gold, and was fifth in the CAC Jr. Championships. Warner snatched Carifta 800m bronze and Leeward Islands gold but did not compete in the CAC Championships. All four athletes set personal bests and with the exception of Huggins, established National Jr. records in their respective events. Koen Penn was the Sol Youth Male Athlete of the Year, with his sister Kala Penn the female recipient. There was no award presented in the male division, which lacked quality performers for the third successive year. Eric “Shaq” Matthias—a 2008 Beijing Olympian—who was also presented with a Lifetime Achievement Award along with his fellow Olympians—won the BVI Athletics Foundation’s 2012 Coach of the Year award for his work with the Gumbs sisters. Veteran Zebalon McLean won the Blenheim Trust Road Racing Male Athlete of the Year Award with Nimande Oniash the female recipient. For his effort, McLean was also recognized by the BVI Athletics Foundation, as the overall Road Racing Athlete of the Year. 1992 Barcelona: Karl “Dub” Scatliffe. 1996 Atlanta: Keita Cline, Ralston Varlack, Mario Todman, Willis “Chucky” Todman, Greg Rymer, Coralea Cline and Steve Augustine.